By Amanda Schierz, Marcin Budka and Edward Apeh (domcastro, BeYou) from Bournemouth University, UK, 1st and 2nd in Music Genres track of ISMIS 2011 Contest: Music Information Retrieval. Thanks for this competition – it was great fun. Software used: R, Weka, LibSVM, Matlab, Excel. This was the 2nd competition I had entered (the first being the SIAM biological one) and I only really entered because I had so much undergraduate marking to do! We developed a novel approach to the problem which involved multi-resolution clustering and Error Correcting Output Coding. 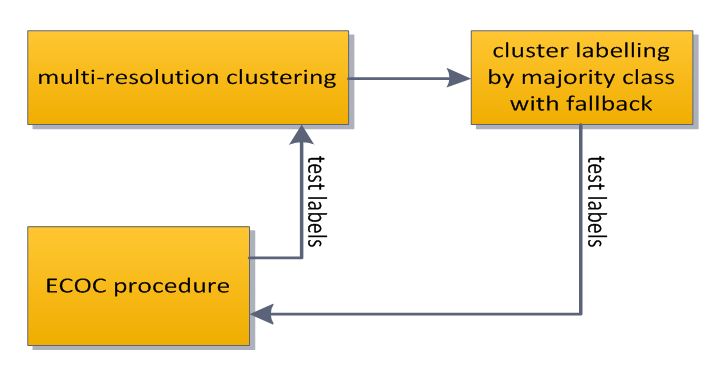 Our 2nd place approach involved transforming the cluster labels into feature vectors. 1. We trained on 50% of the training data using Weka and built an ensemble of a cost-sensitive random forest (number of trees 100, number of features 25), a Bayes Net and a neural network. This resulted in 77.44% on the preliminary dataset. It was very frustrating as we couldn’t improve on this. We then looked at semi-iterative relabeling schemes such as Error Correcting Output Coding (using Matlab and LibSVM). This resulted in 81.59% prediction accuracy. 2. We then decided to look at the “statistics” of number of performers, segments, genres etc. We used R to normalize the data (training and test data) and to carry out K-means clustering, k =6 for genres, k=60 for performers, k=2000 for possible songs etc. Taking each set of clusters independently didn’t give any information. However, as we had pasted the results into the same file, we noticed a distinct pattern when the cluster results were looked at together – even though no crisp clusters were identified, we noticed that if a training instance was of a different genre from the rest of the cluster then it usually belonged to a different lower granularity cluster. We then built lots of cluster sets for the data (multi-resolution clustering). K was set to 6, 15, 20, 60, 300, 400, 600, 800, 900, 1050, 1200, 2000, 3000, 3200, 5000 and 7000 clusters. At the finest granularity cluster (k=7000) a majority cluster vote was taken using the training instance labels and the test set predictions – the whole cluster was relabelled to the “heaviest” class. If a cluster could not be converged at the finest k-level then we “fell back” to a lower granularity cluster (k=5000) and so on. These new predictions were fed back to the ECOC system and the process was repeated. 4. This was the winning solution and resulted in 0.87507 score on the final test set. For the 2nd place solution, we decided to look at using the cluster assignation labels as feature vectors. This transformed the problem from the original 171-dimensional input space, into a new 16-dimensional space, where each attribute was an identifier of the cluster at one of the 16 levels. So, for example, if instance #7 have fallen into the 3rd out of 6 clusters at the first granularity level, 10th out of 15 clusters at the second granularity level and so on, in the transformed space it would be described as a 16-diemensional vector: [3, 10, …]. Note, that these attributes are now categorical, with up to 7000 distinct values at the highest granularity level. This has limited the number of classifiers we could use. 3. Cross-trained ensemble of 100 Naive Bayes classifiers, trained on different subsets of attributes, each time selected using the Floating Forward Feature Selection method. We have used majority voting to combine the decisions of these 3 ensembles. After labeling the test dataset using the method described above, we have fed both training and test dataset (this time with the labels from the previous step) to the ECOC system to obtain final predictions. This resulted in 0.87270 on the final test set.